John Nagy offers an assortment of 1 dozen "hot" Lake Erie steelhead egg patterns and bead head nymphs for $24.95 + $4 s/h + $2.03 Pa. state sales tax (7%) if applicable. John Nagy also offers custom fly orders of Lake Erie egg patterns, nymphs, wooly buggers and streamers for $2.50/fly + $4.00 s/h + Pa. state sales tax (7%) if applicable. See book ordering page for more information on making payments by check or Paypal. 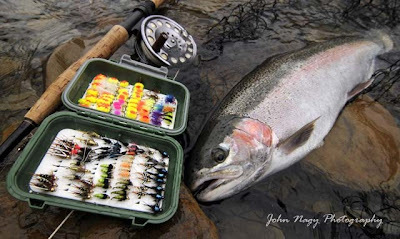 Please contact John Nagy at steelheadguide@hotmail.com or (412) 531-5819 for more details on his custom steelhead flies including custom fly orders and his signature steelhead tube flies.